Born in 1976 in Buenos Aires. In 2002 he directs, co.writes and produced his first long feature film, “TAN DE REPENTE” which was multi-awarded in international film festivals, including the Silver Leopard in Locarno. Same year, Diego is one of the directors selected by Cinefondation of Cannes as a resident in order to work on his new script, “MIENTRAS TANTO” wich is awarded with Opening Shot Prize of Best Screenplay (Cinefondation and Gan Fondation) and premiered at the Venice Film Festival in 2006. Diego also directed nine short films including “LA PRUEBA” (1999) and LA GUERRA DE LOS GIMNASIOS (premiered at Locarno Film Festival 2005). In 2007 he did a documentary Film for Television called “SERVICIOS PRESTADOS” that was also premiered at the Locarno Film festival. 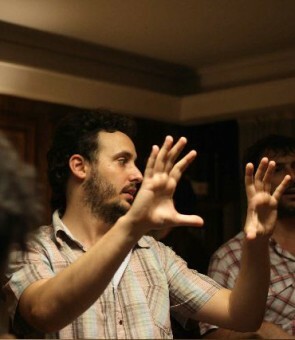 In 2008 he founded with Nicolas Avruj his own production company, CAMPO CINE. In 2009 he won with “LA MIRADA INVISIBLE” (ex – Ciencias Morales) the Sundance NHK Award for Latin America, the project was selected for the Atelié du Cannes 2009 and premiered in 2010 at the Cannes Director´s Fortnight.